Hockey’s Teeth History: Why Do Hockey Players Wear Mouthguards? Why do hockey players wear mouthguards? Here’s a hint: Next time you watch a hockey game, see how many missing teeth you can count. Hockey players missing teeth is a tradition almost as old as the sport itself. When you’re using a stick to move a frozen disc of vulcanized rubber up and down a sheet of ice, accidents are bound to happen. The threat of losing teeth isn’t specific to one sport, and it’s hardly one of the worst hockey injuries that occur. Despite that, hockey is considered one of the most dangerous sports for teeth. 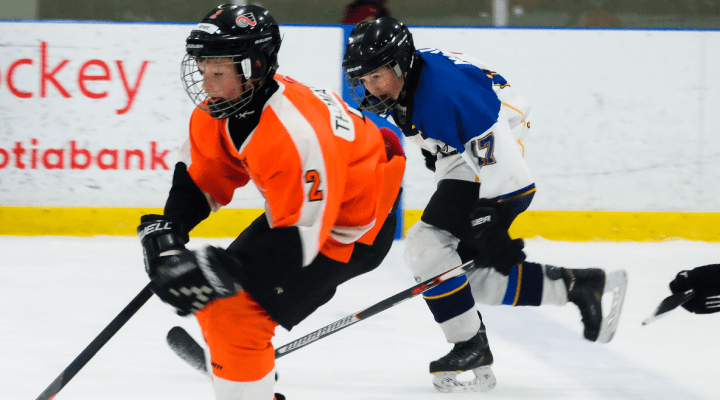 Pucks and sticks—and sometimes fists—are often the culprit for the loss of a few ‘chiclets’. For kids learning the sport, wearing a mouthguard is mandatory until the age of 19 for men and 20 for women. Players caught without one are given a penalty. However, professional players are given the option to wear one (thankfully many do!). Between the pucks, sticks, skating and body checks, hockey players have enough to worry about on the ice. Mouthguards keep you from biting your tongue, smashing your teeth together, and potentially chipping or breaking them due to collisions. Mouthguards are only the beginning. This gooey but firm rubber device protects teeth, but it doesn’t prevent a concussion. Though once a popular belief for using a mouthguard, concussion prevention hasn’t been scientifically proven. However other products are in development for the reduction and possible elimination of the common brain injury. Mouthguards also don’t protect against blunt trauma to the face. While it may lessen damage, the rubber shield isn’t going to lessen the likelihood of hockey players missing teeth. Mouthguards aren’t designed to stop an errant stick or a hundred-mile-an-hour puck. That’s what a full facial cage is for. Looking to keep your teeth in your mouth and your smile looking good? Talk to your dentist about a custom mouthguard and invest in a shield that protects your entire face.